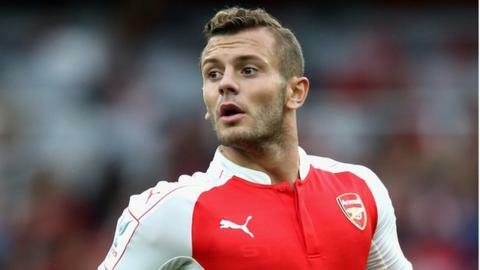 Arsenal midfielder Jack Wilshere requires surgery on a hairline fracture of his left leg and is expected to be out for three months. The 23-year-old broke a fibula in August but was expected to return to training following September's international break. However, the club has said he needs to have a plate inserted in his leg. "Jack's scans show that the healing process is not progressing as well as expected," a club statement read. "He is likely to be out for approximately three months." Boss Arsene Wenger added: "Jack Wilshere is young enough to get over this. I'm confident he can make a career his talent deserves." The 23-year-old had two operations last season after injuring his left ankle against Manchester United in November 2014. He returned to play in Arsenal's FA Cup final win over Aston Villa in May. Wilshere also featured in England's June internationals, netting twice in the 3-2 European Championship qualifier victory over Slovenia. His career has been plagued with ankle problems since he first sustained a stress fracture during pre-season in 2011, which left him sidelined for 15 months.